I critiqued the concept of the “God of the gaps” back in 2013, showing how in the classic argument between Newton and Leibniz which usually forms the basis for it, the latter’s deterministic Deism is hardly the ideal role-model for people who, like Newton, claim to be theists. It is in fact true that the very accusation that a “God of the gaps” argument has been used assumes that a science of efficient causes can explain without remainder the entire reality of nature. But the simplistic idea that science is a universal project that is relentlessly filling in the gaps in knowledge about nature has been comprehensively shown up as false by mainstream philosophers of science, and is particularly well covered by Thomas Kuhn in The Structure of Scientific Revolutions. However, it appears that most theistic evolutionists, like most atheist positivists, aren’t very interested in philosophy of science, which is one reason they so often come across sounding like Richard Dawkins in a cheap cassock. Like others, Kuhn has shown that rather than being a systematic and comprehensive uncovering of nature’s secrets, science consists of asking particular questions to an almost infinitely opaque nature, which in reply returns answers to that set of questions, and that only. The result is more like a series of isolated islands of useful knowledge in a vast ocean than a jigsaw puzzle potentially building to completion. It isn’t so much that the islands are too far apart to build bridges between them, but that they’re actually logically incompatible. One concrete example is the fundamental incompatibility between quantum physics and relativity, an incompatibility hidden from most of us by our inability to comprehend either theory very fully. Although there are many still seeking to unite them (and anything else that may be discovered) in a Grand Unified Theory, there are theoretical reasons why this may be simply impossible rather than hard, because the two theories are looking at different types of scientific reality. Physicist John Archibald Wheeler (a proponent of the idea that information is the fundamental reality of the Universe – “it from bit”) said, “We live on an island surrounded by a sea of ignorance. As our island of knowledge grows, so does the shore of our ignorance.” That expresses admirable humility, but actually our present knowledge consists of many disconnected islands – and they’re set in three, rather than two dimensions, so that many of them may be destined never to converge. In some sense, in the sciences it is explanatory gaps all the way down. One sometimes reads, in the TE literature, some acknowledgement that the scientific method itself has limitations, which implies the existence of such gaps, but the use of “God of the Gaps” as a criticism of others shows that only lip-service is being paid to PoS – there is a closet Leibniz lurking behind the facade every time. But it’s a fundamental truth that, by its methodology, science cannot understand nature, but only abstract what is quantifiable from nature. On that understanding, every actual event, outside a tightly controlled experiment, is an epistemological gap. The “God of the gaps” phrase is used, of course, mainly with respect to the intentions of God, and particularly to “design” when it is used in the context of ID. But it seems to escape people that “intention” can never be a scientific gap, because science deliberately excludes intention from its study. The whole modern scientific project began by concentrating on the efficient and material causes of things, and bypassing final causes, or teleology, as intractable divine mysteries. As soon as we admit teleology into nature (as we must if we are Christians who accept Creation, or cease to be so) we have admitted a level of reality that science, as presently constituted, cannot enter. It is a gap that can only be denied by, like Leibniz only more so, removing God’s active involvement from the world altogether. To put it another way, for an ID enthusiast or anyone else to say that God has acted intentionally in nature is, by definition, to speak into a genuine scientific gap. So much the worse for science, for leaving so many huge gaps and pretending they don’t exist. And yet the exclusion of intention from science is a convention that even scientists have long found to be inadequate.There is a strong sense among many of the most esteemed quantum phsyicists that mind is in some way essential to nature, and therefore that final causation must be admitted – though it’s acknowledged to be beyond the realm of science itself to probe fully. That’s why the several incompatible interpretations of quantum theory come under “philosophy”. Even the existence of the consciousness that is essential for the doing of science – the consciousness that even affects the outcomes of quantum experiments – suggests at least a supervenience of the non-analysable in principle, the fantasies of eliminative materialism notwithstanding. You cannot explain subjectiveness objectively – it’s a gap that cannot be filled by science, even in theory. The naturalist materialist can only dispose of mind by cutting off the branch he’s sitting on. Mind, free will, reason – and eventually even matter itself – dissolve in the universal acid of skepticism about mind. As Conor Cunningham writes, there is a bad smell in every room naturalism enters; maybe it’s not really the rooms that smell. The use of the term “God of the gaps” therefore reveals a deficient (actually scientistic) misunderstanding of the limitations of science, through an ignorance of the Philosophy of Science and, in practice, a denial of the central tenet of Christian theism – the God who acts to change his world. 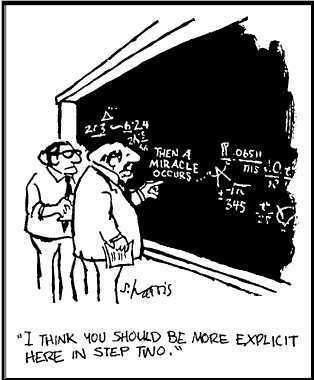 This is a trap that nearly all theistic evolutionists seem to fall into. Is there, then, any traction at all in the term at all? Possibly, but only in a limited sense which, actually, applies to very few real instances. If one resorts to a miraculous explanation when a perfectly reasonable scientific one is readily attainable, then the accusation sticks. But to make such an error is to fail to do the necesssary rational (though extra-scientific) assessment of the case for preferring a “scientific” to a “non-scientific” cause – exactly the same error made by those who make the accusation in cases of proposed divine intention. The classic example is a real biblical miracle. If, as many or most evangelical TEs do, one accepts Jesus’s extraordinary miracles as true, then it is simply crassly inappropriate to try and fit them into the regular pattern of nature. They are extraordinary because they do not fit the regular pattern of nature. To science, by definition, anything outside the regular patterns of nature is not science, and is therefore a gap that it is right and proper to fill with something else, like a fabrication, a miracle, special providence or even a human action – for make no mistake, human products (such as scientific theories) do not occur regularly in nature. A divine intention or action in nature cannot be excluded by science if there is, in fact, such a thing as a God who can work miracles. Neither is it the case that the possibility of evidence for such intention can be excluded, apart from defining science so that such evidence is “unscientific”. For example, this blog is concrete evidence of my human intentionality and my ability to execute efficient causation in its pursuit, but you’d be hard put to it to prove it by science. The miracles of Jesus can be established by history and testimony, but not, in the nature of things, by science. On the other hand, when one of my patients, scheduled for a bypass operation, reported that his symptoms had resolve after healing prayer, and proved to have a clear angiogram, scientific methodology was certainly involved in the evidence trail – but science could not prove a miracle. It wasn’t the miracle’s fault. To say, as many TEs do (often clutching hold of Thomistic metaphysics for the only time in their lives) that God’s hand cannot be seen in nature, one must first establish as a principle that God would not ever do such a work. Such an argument would not be anything to do with science, but with the increasingly tedious (because incoherent and heterodox, but persistent) theological argument of nature’s “autonomy” from any kind of “micromanaging” “tyrannical” “coercive” “puppetmaster” God. Well, you can embrace that stuff if you like – but it has nothing whatsoever to do with the “God of the gaps” anyway. I’ve often wondered (or been more skeptical, rather) about these so-called shrinking gaps. But your description, positing that they may well be more than entrenched gaps –if not oceans of space surrounding disparate little “island” moonlets of knowledge puts a sobering perspective on it! On that reading, there is no shame in thinking God is indeed a Sovereign over the gaps. It seems to me, any collective humility notwithstanding, there may remain still some value in reminding each other that God is not exiled from any of our little or growing islets of understanding either, even if some turn out to be more ephemeral than solid. I’ve appreciated the fractal imagery of boundaries having an infinity of detail no matter how far one zooms in, but then also revealing more and more going the other direction on the logarithmic scale too with no end forthcoming. Just brilliant. Thanks for that, and for much other provocative thought throughout. As an added thought … to those who enthusiastically proclaim some imminent disappearance of remaining gaps between vast continents of exploding knowledge, I can only reply: “your mental world must be much too small”. Where is the Copernican Cliche when you need it? Merv, myths must only be used in their authorised context, and the Copernican Cliché is no exception! But thanks for the comments. I just need to add, I think, a qualifier to the OP (which I know you don’t need to hear, but stray visitors may). The piece is an attack on the “God of the Gaps” argument, and so may come across as suggesting that our “islands of knowledge” are valueless or insignificant. That’s not my point at all – we can have very real, and even pretty complete knowledge, in areas that we study. That includes the sciences, and in individual sciences Wheeler’s picture of the steadily growing island of knowledge, albeit with fractally-enlarging coasts, is accurate. But since some of our “incongruous islands” are not scientific, it also includes everything else: mastery of French cooking, connoisseurship of Mozart or Renoir, flint-knapping or iron-moulding skills, understanding of human nature or even knowledge of God’s revealed word. So Einstein’s words about the surprising comprehensibility of the Universe are still true and still, to the Christian, point to the God who tailors us to his Creation and reveals his ways. I think I see evolution theory, from beginning to end, as an “Evolution of the Gaps”. And blah blah blah. It ‘s turtles all the way down. It’s ‘it evolved’ all the way down. Congrats on making the transition to “turtles all the way down”! Although I accept evolution, I also accept your assessment of the blind-faith and fairy tales position that has nearly always accompanied it. Even from within the materialist camp Jerry Fodor wrote about the vacuuousness of the idea of things “evolving for something” in the Neodarwinist model, and I wrote about it a couple of years ago here.